"Uncle Frank's House: An American Dream", a documentary featuring people and locations of Detroit's East Side, to make big screen debut at Bel Air Luxury Cinema on October 17. Soundtrack by local recording artist John Greasy. 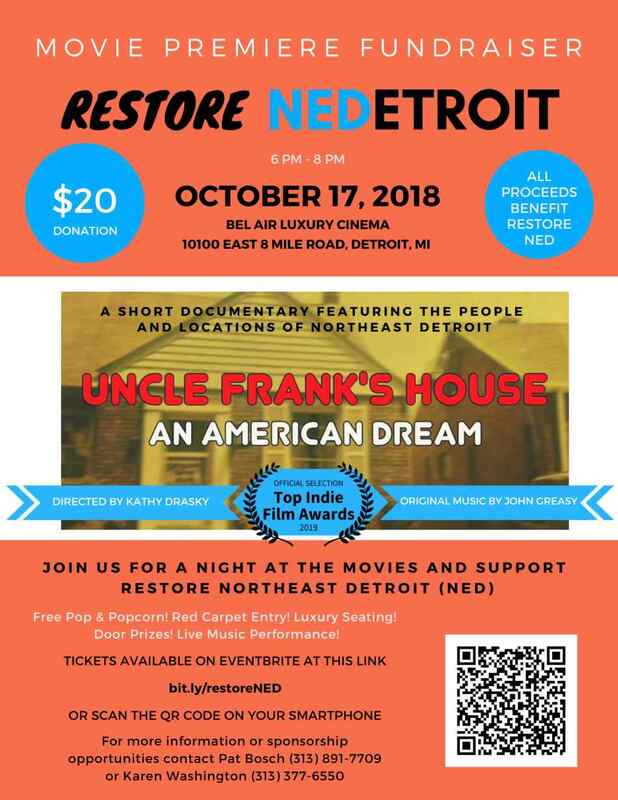 DETROIT - Sept. 24, 2018 - PRLog -- Come celebrate revitalizing Detroit neighborhoods at a movie premiere fundraiser on October 17 to support the work of Restore Northeast Detroit (NED). Newly restored Bel Air Luxury Cinema at 10100 East 8 Mile Road will host the event from 6pm to 8pm. A donation of $20 benefiting Restore NED includes a first look at award-winning filmmaker Kathy Drasky's short documentary "Uncle Frank's House: An American Dream", filmed primarily in Detroit's Nortown neighborhood and featuring community activists Pat Bosch and Karen Washington, as well as local businesses like the historic Two Way Inn. Free pop and popcorn, a red carpet entry, luxury seating and door prizes donated by the community will all be part of the evening, hosted by Restore NED and emceed by Washington and Bosch. Additionally, the movie's original soundtrack, written by Detroit native John Greasy, will have its official launch at the event and a live performance is on tap. "Detroit Life", the movie's lead single, performed by Greasy and featuring local vocalist Taimeek, is already being touted as an anthem for the city -- a celebratory mix of resilience and hometown pride. The film itself is a fresh look at the Motor City and its complicated history of home ownership. Using recorded oral history, found footage, live interviews and videography shot on an iPhone, it explores the rise, fall and reinvention of the American Dream in Detroit from the 1920s through today. Currently on the film festival circuit, "Uncle Frank's House: An American Dream" is an official selection of the Direct Monthly Online Film Festival, the Direct Short and Documentary Film Festival and Top Indie Film Awards for 2019. It was recently named a semi-finalist in the Festigious International Film Festival in Los Angeles. The screening at the Bel Air Luxury Cinema will be the film's official big screen premiere. Filmmaker Kathy Drasky will be in attendance. More information about the film is available at: http://www.unclefrankshouse.com. Restore NED is a coalition of block clubs and neighborhood organizations, established in 2011 to lead an independent land­ use visioning process for the area currently known as District 3. Create NED was launched in 2015 with funding from ArtPlace America to revitalize Northeast Detroit through community art and design, landscape architecture, media, technology and community organizing. If you are interested in supporting the work of Restore NED, Create NED or to be a sponsor of the movie premiere fundraiser night, contact Pat Bosch (313) 891-7709 or Karen Washington at (313) 377-6550. Additional information about the organization is at www.restorened.org.